Original title: ¡No te prives! Currently in many countries in Europe political debates are focused on the sudden rejection of governments for their corruption or ineffectiveness and mistrust in institutions. But it is not always clear what role democratic citizenship plays during these debates, and this is what is really at stake. 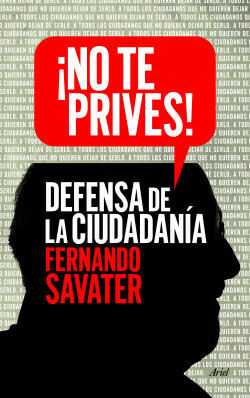 Savater tries to explore this issue and presents an irrefutable defence of the rights and guarantees of the citizen, also reminding them of their duties because without their support any attempt at a political solution will be doomed to fail, undermined by frustration and the democratic posturing of retrograde populism. A combative book that nonetheless never forgets its educational role. A call for us all to recover our political role in the democratic arena.